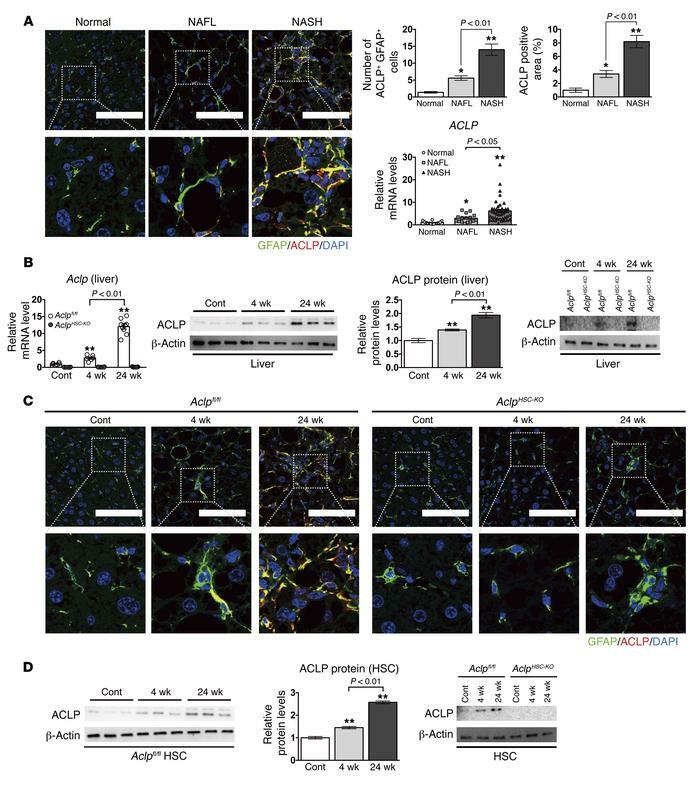 In the liver, ACLP is specifically expressed by HSCs, and its expression increases in both humans and mice as NAFLD progresses. (A) (Left panels) Representative immunofluorescence double-staining images of ACLP (red) and GFAP (green) in human liver tissue samples from controls (n = 14), NAFL patients (n = 16), and NASH patients (n = 44). Costained sites are shown in yellow. The nuclei were stained with DAPI (blue). Scale bars: 100 μm. Single-channel images are shown in Supplemental Figure 1. (Right panels) Quantification of ACLP/GFAP double-positive cells, ACLP staining, and mRNA expression. **P < 0.01; *P < 0.05 vs. control (normal) liver samples. (B–D) Eight-week-old male Aclpfl/fl and AclpHSC-KO mice were fed an HFC diet for 4 weeks (n = 6/group) or 24 weeks (n = 9/group), or fed a control diet (CE-2) for 24 weeks (n = 6/group). (B) (Left panel) Hepatic Aclp mRNA expression levels. (Middle panel) Western blot for and quantification of hepatic ACLP expression in Aclpfl/fl mice. **P < 0.01 vs. Aclpfl/fl mice fed the control diet. (Right panel) Western blot for hepatic ACLP expression in Aclpfl/fl mice and AclpHSC-KO mice. (C) Representative images of immunofluorescence double-staining of ACLP (red) and GFAP (green), with costained sites shown in yellow. The nuclei were stained with DAPI (blue). Scale bars: 100 μm. Single-channel images are shown in Supplemental Figure 4. (D) (Left panel) Western blot for and quantification of ACLP expression in HSCs in Aclpfl/fl mice. **P < 0.01 vs. HSCs in Aclpfl/fl mice fed the control diet. (Right panel) Western blot for ACLP expression in HSCs in Aclpfl/fl mice and AclpHSC-KO mice. P values obtained via 1-way ANOVA with Tukey’s post hoc test. Data are shown as SEM.